Hi everyone, hope you are having a great weekend! Well, its still freezing cold and I really am not a fan of cold weather. It makes me miserable, I feel totally unglamorous and long for sun, LOL!! I've been after a statement coat for a while now, but not in black. I'm still on the hunt for one, preferably vintage, but I may now wait until later this year, so I can save up for a really lovely one. I've been wearing my fugly black parka coat and although it ticks all the boxes on the warmth and practicality front, I feel so unstylish in it! 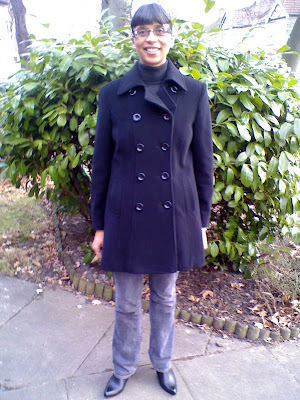 On my walk home from work in the week, I had my usual browse in the charity shop and came across this black wool pea style coat by BHS for £9.95. 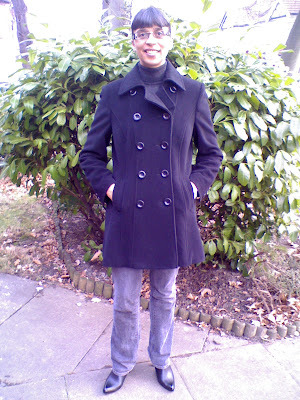 I snapped it up, as I needed a basic black winter coat that is timeless in style and will keep me cosy too. I'm also wearing my new shoe-boots from Aldis for only £8.99. They are high heels, so I don't wear them regularly at the moment, but they are a welcome change from my flat boring boots, haha!! Sharon, it's a savvy basic which a gal just can't go wrong. jazz it up with a bright sweater or scarf. You'll get a lot of wear out of that coat. Hi Savvy-yes indeed, accessories will definitely brighten it up, thanks! Hi Wendy-thanks my dear, its certainly a wardrobe staple. Such a successful snag - you are the best! Hi Kate-thanks, its great to have a stylish basic for winter! Hi strawberry fields-thanks for your lovely comment! I love that coat. Its such a classic. Nice boots too. well, snowboots here. I notice mine has some sort of residue like a salt or something on them too. Yuck. Really I have a comfy pair but lugging them around all day does make one tired...as well as tired of the cold. Hi ellie-hope you get the salt off your boots, thanks for your comment too! Who even knew Aldi did shoes? Great find on the coat, looks lovely and warm! Hi winnie-thanks my dear! Yes, I was only in there for cereal and I saw them, great price too! AND: grey jeans mhmmmmm. Great find! Haha! Hi janettaylor-thanks a lot my dear! Hi the seeker-yes, warmth comes first every time, unfortunately, haha!